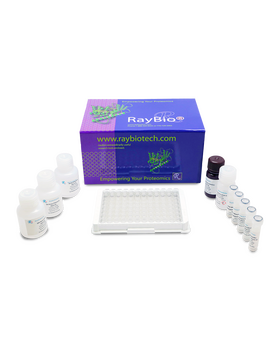 RayBio® Human/Mouse/Rat Phospho-JNK (T183/Y185) and Total JNK ELISA Kit. This assay semi-quantitatively measures phosphorylated JNK (Thr183/Tyr185) and Total JNK in lysate samples. 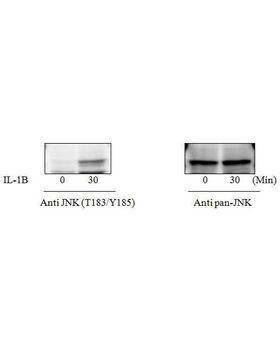 The antibody pair provided in this kit recognizes Human/Mouse/Rat Phospho-JNK (pThr183/Tyr185) and total (pan) JNK. 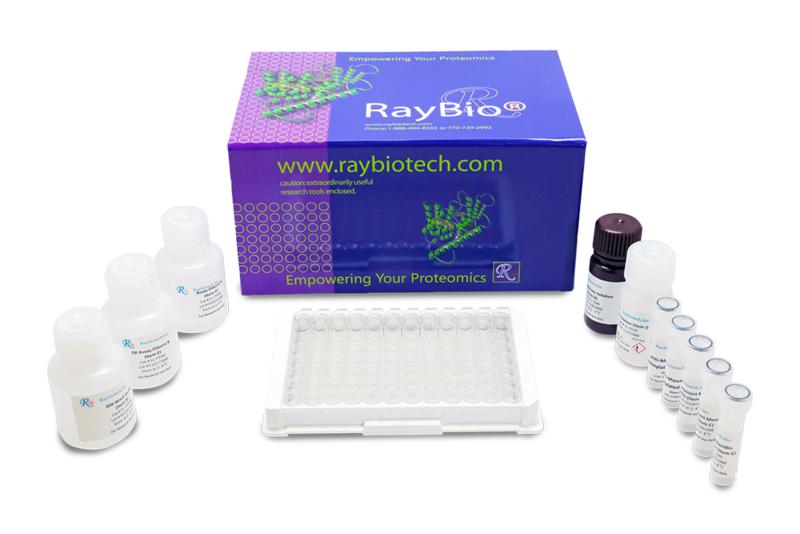 RayBio® Phospho- JNK (T183/Y185) ELISA kit is a very rapid, convenient and sensitive assay kit that can monitor the activation or function of important biological pathways in human, mouse and rat cell lysates. 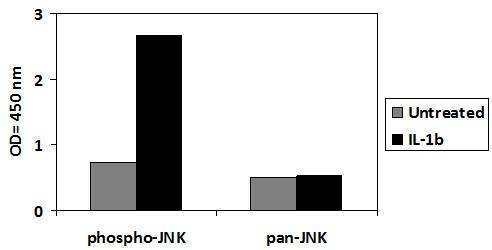 By determining phosphorylated JNK protein in your experimental model system, you can verify pathway activation in your cell lysates. You can simultaneously measure numerous different cell lysates without spending excess time and effort in performing a Western Blotting analysis. This Sandwich ELISA kit is an in vitro enzyme-linked immunosorbent assay for the measurement of human, mouse and rat phospho-JNK. An anti-pan JNK antibody has been coated onto a 96-well plate. Samples are pipetted into the wells and JNK present in a sample is bound to the wells by the immobilized antibody. 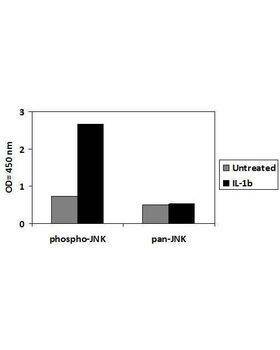 The wells are washed and rabbit anti-JNK (T183/Y185) antibody is used to detect phosphorylated JNK. After washing away unbound antibody, HRP-conjugated anti-rabbit IgG is pipetted to the wells. The wells are again washed, a TMB substrate solution is added to the wells and color develops in proportion to the amount of JNK (T183/Y185) bound. The Stop Solution changes the color from blue to yellow, and the intensity of the color is measured at 450 nm. li id="aeaoofnhgocdbnbeljkmbjdmhbcokfdb-mousedown">Prepare all reagents and samples as instructed in the manual. Add 100 ?l of sample or positive control to each well. Incubate 2.5 h at RT or O/N at 4 ?C. Add 100 ?l of prepared primary antibody to each well. Add 100 ?l of prepared 1X HRP-Streptavidin to each well. Add 100 ?l of TMB One-Step Substrate Reagent to each well. Add 50 ?l of Stop Solution to each well. HepG2 cells were treated with IL-1Β at 37oC for 30 min. 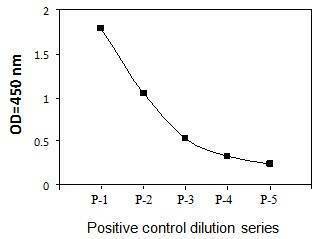 Solubilize cells at 4 x 107 cells/ml in Cell Lysate Buffer. Serial dilutions of lysates were analyzed in this ELISA. Please see step 3 of Part VI Reagent Preparation for detail. HepG2 cells were treated or untreated with 25ng/ml IL-1Β for 30 min. Cell lysates were analyzed using this phosphoELISA and Western Blot.